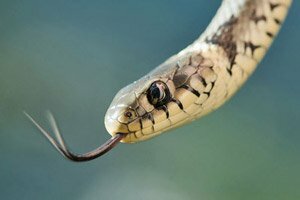 What is a sagra? Want to know some more? The Maremma sagre page (link at the bottom of this one) will tell you about "Le Sagre" in Maremma and what to expect when you get there. If you don't fancy a full sit down meal but still want to try some traditional home cooking in a relaxed atmosphere with local Maremmans, then you can! Throughout the year there are town festivals celebrating the seasons or local products that will have food stalls selling all kinds of tasty nibbles as well as whole plates of delicious food; from the "Festa della Primavera" (spring festival) with Maremma's speciality of violet artichokes, to the "Festa della Fava e del Pecorino" (the festival of broad beans and pecorino cheeses - delicious!) inside a medieval castle on a stunningly beautiful island. You'll have to take a short, but oh so wonderful, ferry ride to attend that one! You will find all of those in my Maremma events page. I have listed the sagre in alphabetical order by town. Just click on the "Agenda" tab on the widget at the bottom of this page to see all of the dates and times for each one - most run over a weekend/ten days, to a couple of consecutive weeks - as organisers publish them during the year. Motoraduno delle Frittelle - a pancake event! 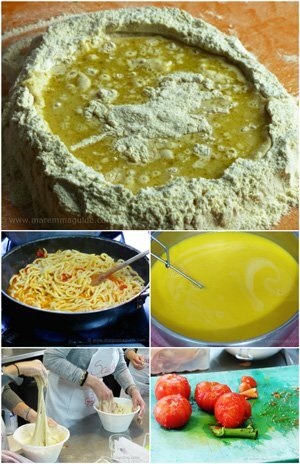 This food event of lunches and dinners of typical dishes of the Amiata area, together with classic "fritelle di San Giuseppe" (Saint Giuseppe pancakes), some of which have unusual batters of vegetable, rice, milk and lemon. Food stands, local product tastings, guided visits to the castle, folklore and music from 17:00 on the Saturday and from 11:00 on the Sunday. These sagre in April mark both the beginning of spring and the annual sagre season. You will need to take your chances with the weather! But if you are visiting Maremma during April don't let a shower or thunderstorm deter you from experiencing a sagra. Go prepared, and you will experience the wonderful taste of traditional local Maremma food and great company in a unique environment. There is even a real live Maremman cowboy show! 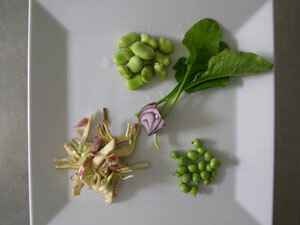 A gastronomic event to celebrate spring held in the "Campo Sportivo" (sports ground) in Alberese. 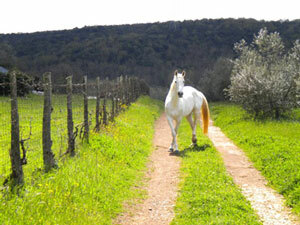 And on the May dates, each afternoon there is a programme of Maremma cowboy - "i butteri" events. Well worth a visit. This gastronomic event starts the season of "sagre paesane" - sagre in the Pisa region. Typical dishes include broad beans with pecorino cheese (a combination I can highly recommend if you have never tried it) and "zuppa di fave" - broad bean soup, plus other typical local produce. This isn't a sagra, but worth a mention as this food and wine event offers the opportunity to taste all of the dishes typical of the Livornese kitchen using the simplest of ingredients. Open every evening and on Sunday for lunch, but booking is essential. A gastronomic event as part of the festival of the saint San Marco, with processions, music and dancing in the evenings. 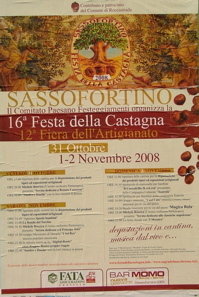 One of the carciofo festivals in Tuscany. Taste dishes made with the "carciofo violetto" - a species of violet artichoke grown in Maremma, along with other culinary specialities of the area. This sagra is also well known for its live music and dancing. The restaurants open at 12:00 noon and 19:00 over the weekend and at 19:00 on weekdays. Location: the Parco Comunale di Riotorto - called "La Pineta". A gastronomic celebration on the day after "Pasqua" (Easter), with traditional local characteristic dishes of food based upon lamb and cooked in every way possible! Music and shows. Sorano's spring festival includes a lunchtime and evening sagra in the town's main square. accompanied by live music in th eevning. 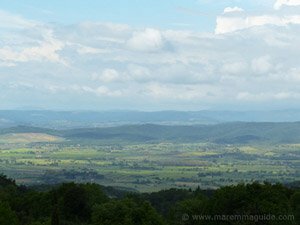 The Maremma sagre in May: what can I say? This month is simply one of the very best times to visit Italy and la Maremma anyway, but in May the season of eating outdoors really gets going with a wonderful selection of food festivals celebrating the season of Spring with typical local cuisine based on the fresh artichokes, broad beans, mushrooms and strawberries that come into season this month. And lots of fish! At most of the sagre events listed here, as well as the great food for either lunch or dinner, or both, you will also find traditional local Tuscan food stalls, music, dancing and a variety of competitions or shows, from jeeps to dogs! Traditional Maremmana home-cooking prepared by the skilled cooks of the Consorzio Welcome Maremma, accompanied by music and a piano bar. 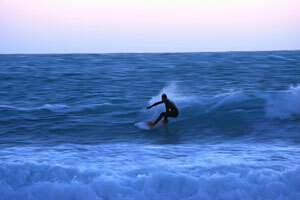 Also offering other Maremmane specialties, from 19:00 each evening with an orchestra and dancing. 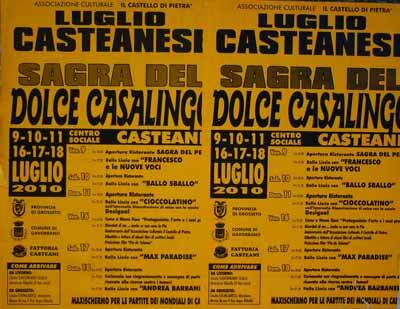 This sagra dei pici is the oldest celebration of the Comune of San Casciano dei Bagni and is held in the historic centre of Celle sul Rigo. The pici pasta is the characteristic "primi piatto" - first course - of Celle and is made by hand following an ancient recipe by the women of the town. Lunch, and dinner with dancing, in the sports ground at Cetona. A gastronomic show in the port. 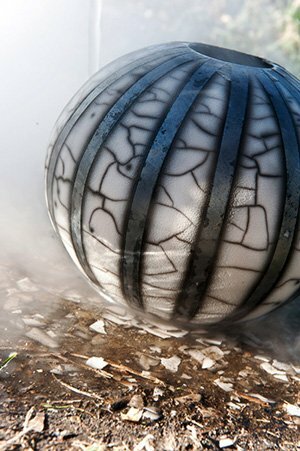 Held in the main piazza with gastronomic stands, music, dancing, a dog show and an exhibition of local farm products. Every evening and also for lunch on some days. This sagra is part of the festival of the San Servilio and culminates with the Palio ‘PINTATA DEL ROTOLO' (starting at 18:30), dinner in the park, orchestral music and dancing and a firework display. 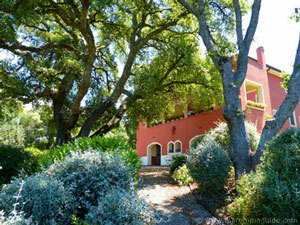 Each evening there are food stands, a pizzeria and a wine bar serving the Montecucco DOC wines. Open for both lunch and dinner. A gastronomic event dedicated to the snail (not one of my personal favourite foods, but each to their own!) with music and dancing in the town's piazza (square). Held in the San Lorenzo sports ground at this sagra you will be able to choose from a range of game based typical dishes with local wines. Taste dishes made with the "carciofo violetto" - a species of violet artichoke grown in Maremma, along with other culinary specialities of the area. This sagra is also well known for its live music and dancing. The restaurants open at 12:00 noon and 19:00 over the weekend and at 19:00 on weekdays. Location: the Parco Comunale di Riotorto - called "La Pineta". Gastronomic stands as well as sports events and dancing. At this month's food and wine festivals you can choose from the traditional tortella pasta, fried fish, snails, buffalo, wild fruits, themed costume dinners, beer... all mixed with music, sports, dancing, shows and markets! Gastronomic stalls in the village from 19.30 each evening. A dinner of typical dishes from the time of harvesting by hand, such as "frittata" (omelette) with tomato, tagliolini pasta with chickpeas and tagliatelle pasta with meat "ragu" sauce. With themed costumes and music. You must book to attend this event (Tel. +39 0564 994187). At this sagra you will be able to taste "tortelli maremmani" - the speciality of Maremma containing ricotta cheese and spinach - "funghi porcini" (porcini mushrooms) and other local speciality dishes. At this sagra you will find food stalls, sport events and evening dancing to a live orchestra.Eevery Saturday and Sunday throughout June. If you are visiting Maremma this month, then you are spoilt for choice for sagre and festivals involving food. 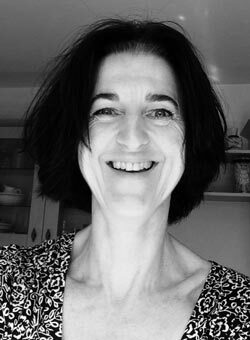 There are forty different events ranging from archaeology, football and cycling feasts, carnivals, concerts, harvest celebrations, and democratic festivals, to concert bands, beer festivals and slow cooking. As well as traditional sagre with dancing! All with great home-cooked food such as wild fruits and wild boar, octopus, fish, snails, grilled meats, old-fashioned snacks... To potatoes and tripe! Rosso in Carne - literally, "red meat"
I'll be missing this one! (no disrespect to the festival, snails aren't my kind of food!). A costumed dinner of traditional dishes to celebrate the traditional threshing undertaken at this time of year. I am definately going to this one! With music, dancing and exhibitions. A gastronomic event with music in the piazza from 19:00. Zuppa di pesce is one of my favourite Italian fish dishes but takes ages to make, so I am going to try and make this one! Sagra Gastronomica "Festa d'Estate" - the Food Festival "Summer Party"
Food stalls and live music from 19:30. With music in the square. A gastronomic event with dishes of typical Maremmana cooking and agricultural products, fruit and vegetables cultivated around the village. The food stands open at 19:30. An annual festival with a menu of wild boar recipes as well as other ancient Tuscan and Maremman dishes such as aquacotta and panzella with grilled local meats, local desserts and seasonal fruits. You will also find food stalls, a bar with homemade "gelato", music, dancing, parades, an exhibition of ballet, tournaments and a traditional Saracen joust. Held in the sports field. A festival of "gnocchi" - small and wonderful potatoe dumplings - a beer festival, and an art and craft market, pony and carriage trips, horse rides, music, dancing and food stalls! Something for everybody! 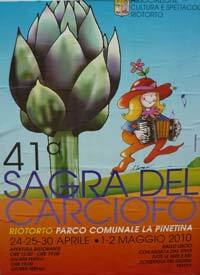 This sagra is held in the historic centre of Roccastrada. A gastronomic event with a dinner (reservation necessary for this one). A classic Maremma culinary festival, with shows, music, food stalls, painting and artisan exhibitions, evening dancing, games and "dolce" dessert and sweet stands... Mmm! The festival of "La Torba" fish with fish dishes and local wines. In August everybody down on holiday in Maremma is at a sagra! There are lots to choose from. At this sagra you will find local products all based on the humble potato along with a street market and concerts. This six day sagra celebrates a Maremma speciality dish from Capalbio of "il buglione": a recipe of marinated lamb with vegetables, wine, vinegar and spices. In the locality of Casa Mora, just outside of the centre of town. Gastromomic stands, live music and dancing in the Campo Sportivo, in the "Il Cristo" locality. Typical local recipes of tortello pasta and mushroom soup. The stands open at 19:00 each night. For the meat lovers amongst you, outdoors in the cool air of the Parco Comunale Il Piano (at 850 metres above sea level) you can eat some locally reared steak and other dishes served from gastronomic stands, and listen to some live music at the same time. A village event with gastronomic stands and dancing. 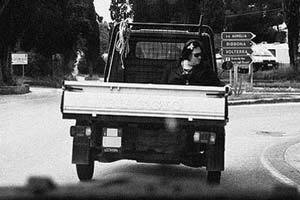 On the Campo Sportivo for nine days. Three evenings of live music, dancing and plates of typical Maremmani food. Entrance is free. 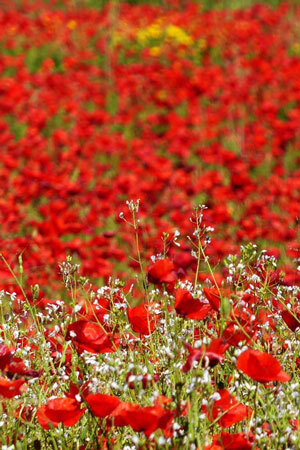 Held in the Campo Sportivo just outside of the centre of town. Food tastings of everything made locally with ricotta cheese, acompanied by local musicians, street artists and a street market. If you are looking the Italian word, "moscardino" up in your phrase book or dictionary, you will find that it lists "doormouse"! But the moscardino" is also a small octopus, which is what you will be eating if you head on over to the lovely port of Talamone in the summer. This sagra is held in the town's main Piazza del Porto. Sagre in September in Maremma: the richest month for Tuscany festivals of food and wine. 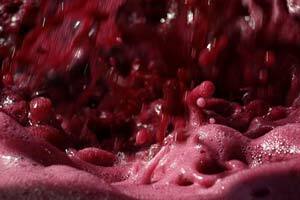 Visit a Tuscany grape harvest festival and taste wonderful wines in a cellar deep beneath a medieval hill town. 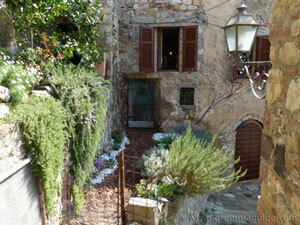 September is also one of my favourite months in Maremma and one of the very best times to visit Italy. Choose from a frog festival with a Palio race! to Maremmane soup, Porcini mushrooms, local pork sausages, pumpkin, bruschetta, wild boar, eel and pizza! 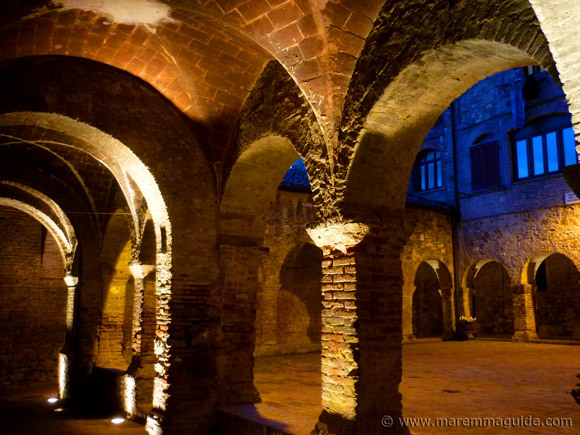 Plus many unmissable opportunities to visit beneath the historic centres in Maremma's towns and villages in their wine cellars with wine tasting along the way. At this sagra you will find the Porcini mushroom cooked in every possible sauce! with gastronomic food stalls (open for lunch on Sunday as well), shows, dancing and live music. Food stalls and a celebration of the Madonna del Conforto. A great opoortunity to try Maremma cooking with wild boar dishes based on old Maremman kitchen recipes, music and food stalls. Bruschetta and other local dishes with shows and entertainment. An end of Summer and unusual food festival in Maremma for it is dedicated to the frog (although you can by ready prepared frogs in the COOP supermarket - not my taste I have to add - this sagra is the only one in Maremma that I know of that serves frog speciality dishes). On the last day there is a "palio" - the Palio della Granocchia - a race through the principle street of the town with wooden wheelbarrows and Maremmane frogs! Lunch and dinner in the towns square, with attractions, shows and music. Concerts, dancing, food stalls, shows, artisan stands and the towns cellars open for visits and wine tasting. 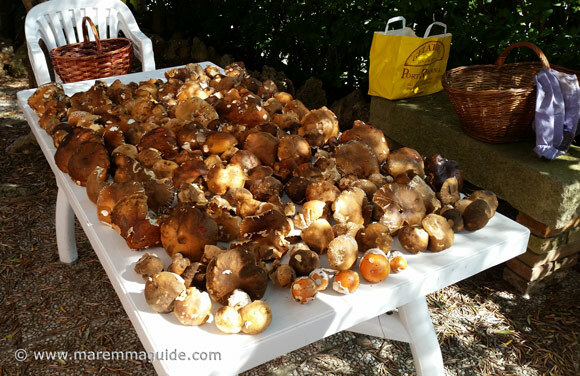 In October in Maremma the autumn is really beginning to show its colours and the "sagre" are dominated by the treasures of the woodland: porcini mushrooms and chestnuts. But you will also find a pumpkin or polenta dish or two as well, with live music and dancing. It is the season for celebrating harvests of all kinds. These sagre are true favourites of mine. 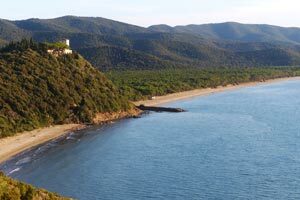 The summer food festivals, catering to Maremma's many holiday visitors along her beautiful coastline, have come and gone with the stifling heat. These autumn sagre, however, reflect traditional life here in rural Maremma. An historically hard subsistence from the land and sea, supplemented by what could be gathered from the dense woodlands covering Maremma's hills. The speciality local dishes you will find at these events are based upon simple, fresh ingredients and recipes passed though the generations that make the most of them. They taste wonderful. October days are warm and the evenings cool (so take a jumper..): I love autumn. Have a great time. Taste porcini recipe dishes and others typical of the Amiata area in Maremma, with food stalls open for both lunch and dinner. Food stalls with a range of polenta based dishes as well as typical Maremman pasta specialities such as tortelli stuffed with ricotta and spinach or pappardelle served with a meat ragu sauce. Open on Saturday for dinner and for both lunch and dinner on the Sunday. A porcini mushroom festival in which you will find it prepared and cooked by the towns chefs in every which way possible: from the house specialities of polenta, to risotto and soup, to dipped and fried... If you love porcini, then this sagra is for you. Open for lunch and dinner with dancing in the evenings, ans food stands with local cheeses, salami, and fresh porcini mushrooms, as well as desserts and cakes. If you miss arriving in time for lunch, don't worry, as there is a bar that is always open serving panini and "donzelle" :) to keep you going. Roasted chestnuts and local dishes in the metalliferous hills of Maremma. OK, Scarlino has two sagra's but really just the one that continues but with a different menu. The first weekend sees the emphasis on just the porcini mushroom, whilst the following two weekends are for both the Marrone chestnut and porcini. Saturday nights there is dinner and live music - the group and singer sets up in Piazza Garibaldi in the centre - and Sunday both lunch and dinner. A little note: although there are a couple of stands open during the day, they are the type that sell homemade stuffed cats or herbal creams. There isn't anything to see or taste between lunch and dinner. Which is a pity because it is a great location. 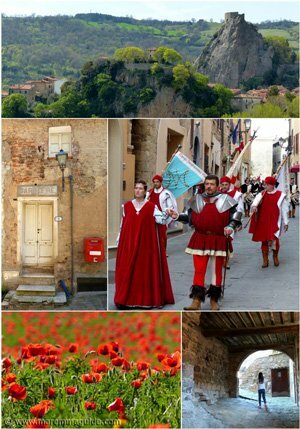 Traditional town and village events in Maremma during the month of November are dominated by the autumnal produce of the densely wooded Maremman hills, the celebration of the olive harvest and the production of extra virgin olive oil. The weather at this time of year means that there are few "sagre" in the sense of the seated outdoor eating venues held during the summer months. Instead, there are many gastronomic "feste" (festivities) held in a towns main "piazza" (square) and streets, with lunches and dinners with a menu of local dishes adapted to the event served indoors in local participating restaurants. Every festival and gastronomic jamboree you could imagine and more throughout the year in Maremma on one page - all the events in Maremma. The whole town bustles with its families and those from the surrounding villages and hamlets, with markets, street artists,music, and wine tasting. In many places the towns "cantines" (cellars) are opened, enabling you to visit otherwise unseen centuries old parts of a town. TIP: Don't miss the opportunity to visit a towns cellars if you can: some "cantines" have ceilings more than 15 metres high underneath the medieval "palazzi" (houses and apartments) above, and are often reached by winding steep paths that plumet down... A unique experience well worth undertaking. 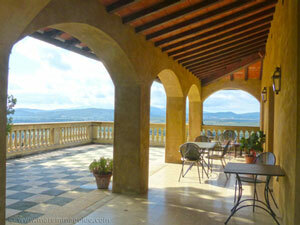 Plus, more often than not you will be offered of a small tasting of the "cantina" owners wine! Eating outdoors in winter with strangers doesn't come much more atmopsheric than this, but you will need to book to have a seat at these medieval tables served by wenches! 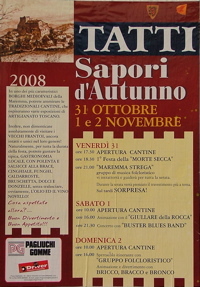 Sagra di Suvereto - Feast of Suvereto. This is a great Tuscany festival: dedicated to wild boar, art and folklore, with the town in costume and an indoor sagra it is one not to be missed. You'll aslo be able to purchase local wild boar foods to take home with you.